Read the tutorial on syncing a slider to a data-source. The project file for this tutorial can be downloaded here. Also see the in this series, working with Step Sequencer color tracks and Building the Waveclock Demo template. 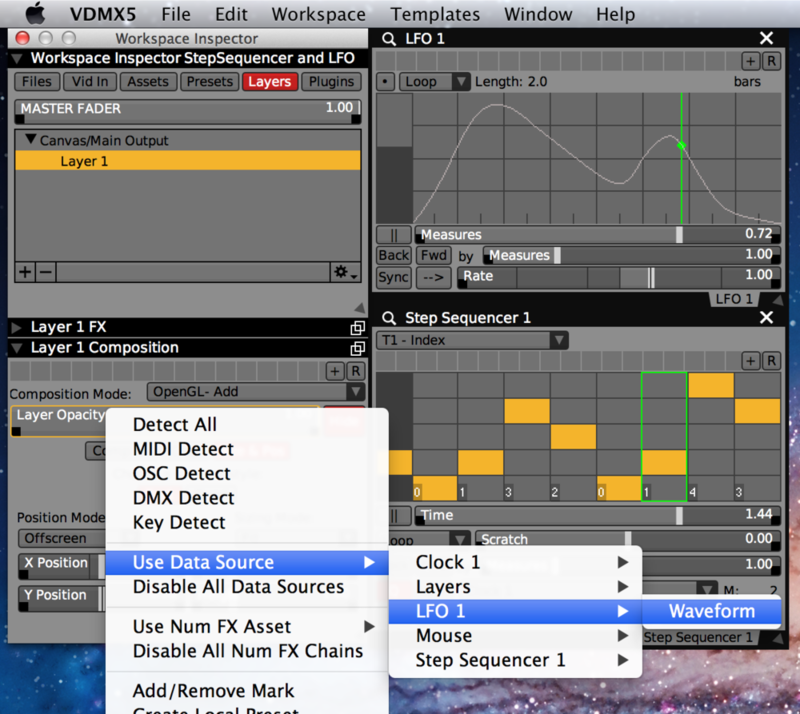 Step 1: In the 'Workspace Inspector' in the 'Plugins' tab create new 'LFO' and 'Step Sequencer' plugins. Step 2: Drag the control handles in the LFO to change how the control values change over time. Click on cells in the Step Sequencer to change the value for each column. Tip: In the LFO hold the 'option' key while clicking to add and remove control points along the waveform, or use the UI inspector to manually set each point. Basic LFO and Step Sequencer plugins. Step 3: Sync a slider (for example the opacity of a layer) to the LFO or Step Sequencer. In addition to bezier curves the LFO can produce sine waves, random numbers and other number generators. Step Sequencers track data-types include indexes, numbers, colors, and booleans (on/off). Values generated by the LFO and Step Sequencer plugins are available as data-sources for sliders and other UI items. Both the Step Sequencer and LFO can have multiple tracks / waves of different data types within a single plugin. The inspector for the LFO plugin can be used to add, rename, delete and customize other individual waveform settings. 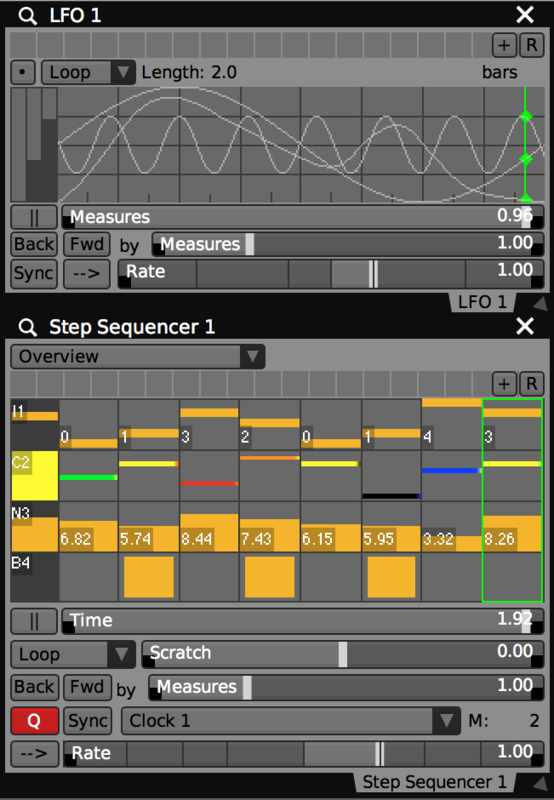 Inspector for the Step Sequencer plugin with four tracks, one of each type. Use the 'Name' column to change the titles of tracks. Who is the legendary Sarah Landau? Julia Maria Morf talks with us about transparent screens! SSWIII's 2019 Daily A/V Experiments, Creative Commons loops and other hotness.